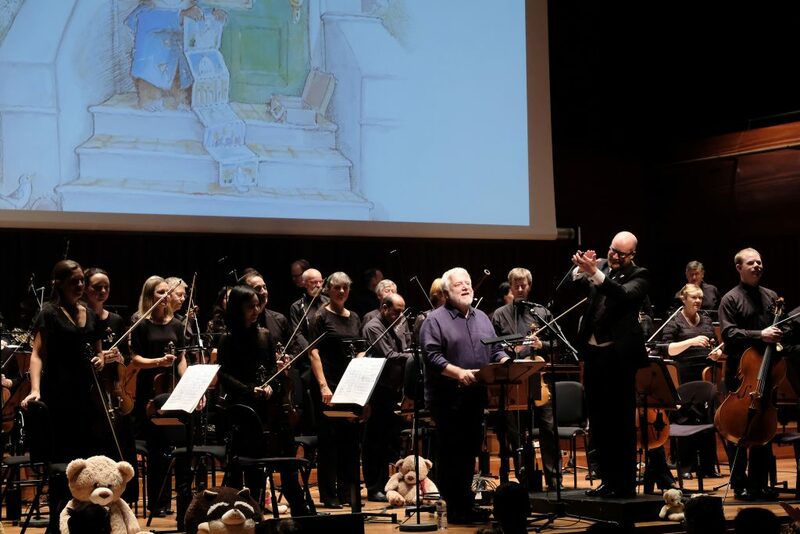 Paddington’s Musical Adventures performed by the BBC Symphony Orchestra, conducted by Ben Palmer, narrated by Simon Russell Beale and presented by Lindsey Russell (Illustrations by R.W.Alley) in Milton Court concert Hall on Sun. 7 Oct. 2018. It’s been a busy day. A spontaneous trip to Winchester for me and Eva yesterday rolled straight into a spontaneous sing at church so by the afternoon I was ready for something soothing. And a Paddington-themed concert by the BBC Symphony Orchestra seemed just the ticket. First though, we had to find it. Essex Road station was unhelpfully shut so we couldn’t get the secret train to Moorgate, but the 271 did pretty much the same job and we managed to find a food outlet that was open on a Sunday too, which isn’t easy in the City. Bless you Leon and all your lattice fries. 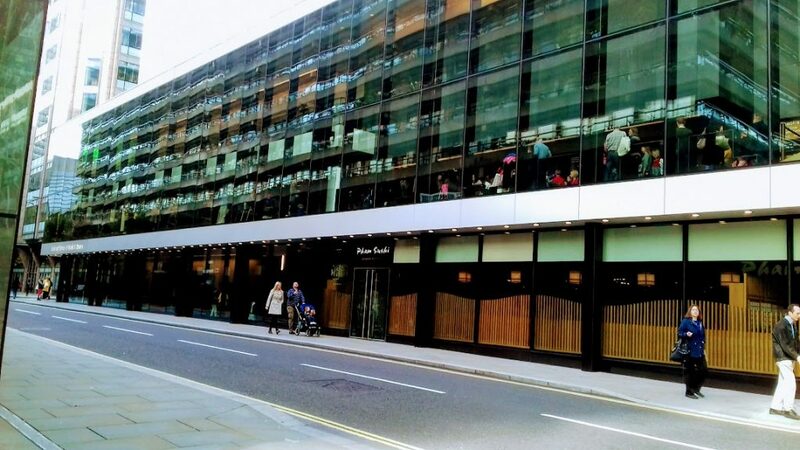 I’d never been to the Milton Court Concert Hall before but I keep a pet musician at church who knows about these things and he told me that it wasn’t part of the Barbican Centre as I’d thought, but over the road in the Guildhall School of Music & Drama. The giveaway when we got closer was the large windows of the foyer seemed to be filled with small children and accompanying parents. I was pretty sure we’d found the right place. We didn’t have enough time to get to the hands-on musical workshop before the concert but it looked fun – lots of little ones trying out different orchestral instruments. 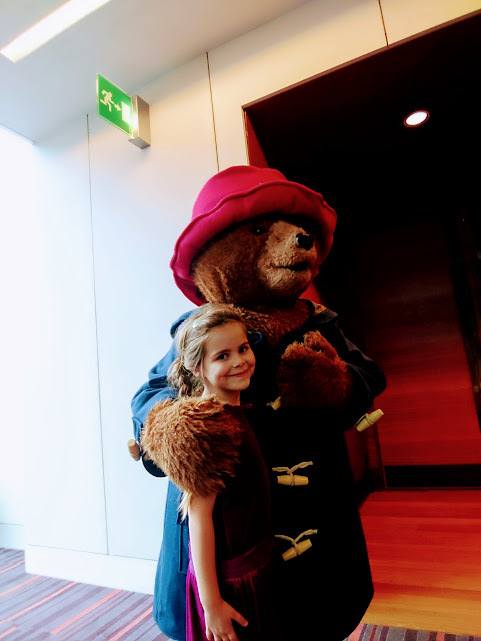 We just about had enough time for a loo trip (on Level 2 to avoid the crowds) and for both kids to have quick hugs with Paddington before the show started. There were two parts to the concert, which was introduced by Blue Peter presenter Lindsey Russell. 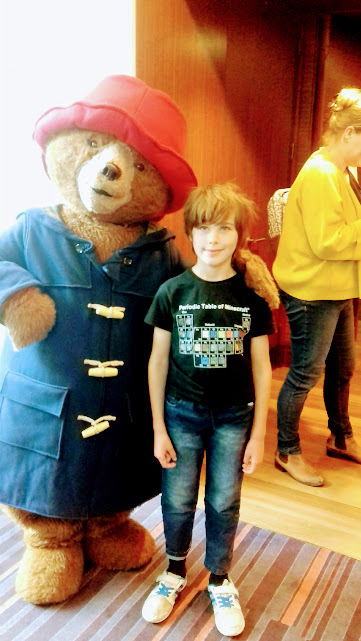 The first was a story called “Paddington’s First Concert”, with accompanying soundtrack by the orchestra and the second was a new story called “Paddington at St Paul’s” – both were written by Michael Bond and narrated by Simon Russell Beale, who you might recognise from “The Death of Stalin”. 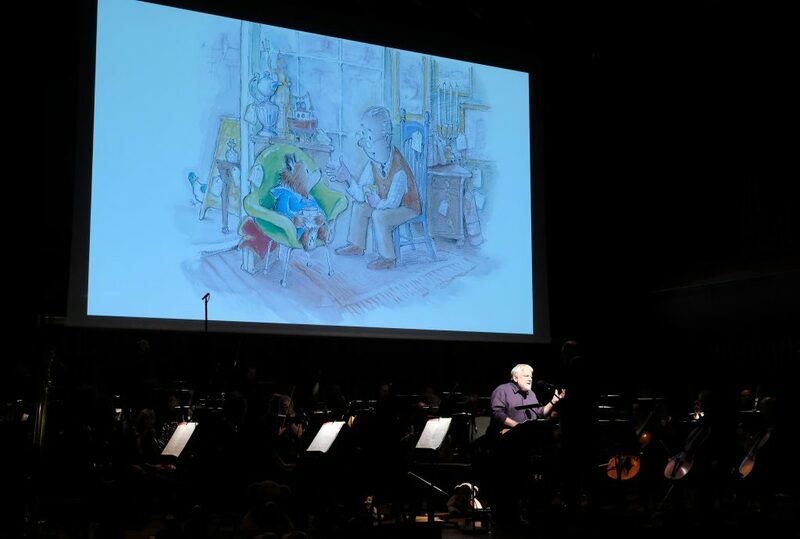 “Paddington’s First Concert” included some of the origin story and a charming version of the classic theme tune, which recurred throughout the story and even had lyrics sung to it at the end by the narrator. The orchestra added other musical motifs through the story – a trilling flute to represent the birds of Darkest Peru and snatches of Haydn’s Surprise Symphony, which the orchestra in the story were playing. It was a simple enough tale but very Paddington, with some unfortunate misunderstandings and mishaps. The setting for the story was the Royal Albert Hall, which was slightly incongruous when we were in such a different and more modern venue but the kids both whispered excitedly when it was mentioned (“we’ve been there!”). “Paddington at St Paul’s” was published recently to celebrate the 60th anniversary of Paddington and was completed by Michael Bond before his death last year. This section was exciting because it had some gorgeous illustrations which helped the kids to focus – they get a bit restless of a Sunday afternoon and listening isn’t their strong at the best of times even when it’s listening to a world-class orchestra. So there were pictures to look at, a story about what Eva would call a Yundon Yandmark (she’s learning about those in school) and some famous pieces of music interspersed, like “The Flight of the Bumblebee”. 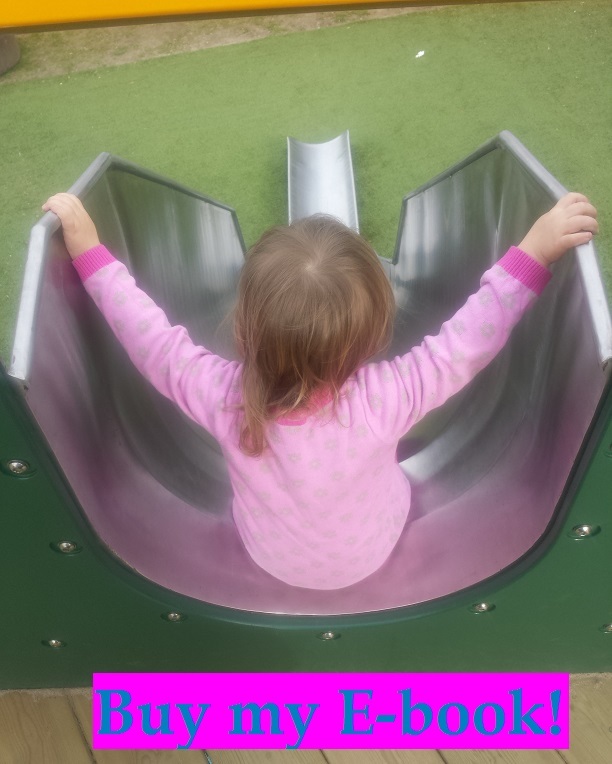 It worked so well together and kept the kids’ interest to the end. There was only one place where the music got a little too soothing – I think it was the Tchaikovsky (“Preghiera from Mozartiana”) and all around me kids and adults started snuggling down a bit. I can’t be the only one that didn’t want to go back out into the real world after that. It’s not quite so soothing out there! So a lovely afternoon – Paddington has a timeless appeal and his charming, cheeky nature appeals to today’s kids as much as it did 60 years ago. The music was superb, the narration evocative and really interesting to learn some facts about Michael Bond (Did you know that he was a cameraman on Blue Peter?). It was also great to have a snoop around a relatively new venue on London’s cultural scene. “Paddington’s Musical Adventures” will be broadcast on BBC Radio 3 in December. More details to follow! This entry was posted in Reviewing the Situation and tagged Central London, music, theatre. Bookmark the permalink.